Most of my career has been about improving processes within the CAD industry. I call it process improvement but you could refer to as: Lean Six Sigma, Total Quality Management, Kaizen, and Agile Management. Process Improvement is important because you need to continually improve in order to stay competitive. This is true for individuals and companies. Some of you are old enough to remember when drawings were done by hand – not too long ago. Then came the big mainframe computers. After that things moved quickly to smaller CPUs and faster processors. Each generation of change was a study in process improvement. Drawings could be completed faster. Changes to designs could be implemented faster. Everything was faster and more accurate. At least, that was the plan. If a company wanted to stay in the game they had to keep up with everyone else. The same is true today. Every firm uses CAD for their designs. So what sets your firm apart from everyone else? A process is any series of actions or steps to get the desired outcome. Perhaps you roll out training to improve productivity. Maybe you create custom tools and toolbars. Or you might use product upgrades as a good time to make changes to the way you do things. It all has to do with improving the way we do stuff. 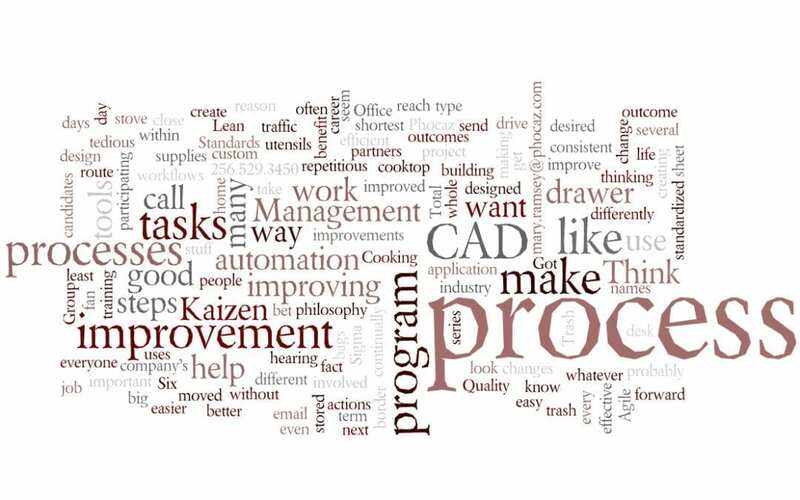 Our philosophy at The Phocaz Group is to continually improve processes. We want to help you make your work days more effective and efficient. Think of process improvement as a way to make changes for a good reason. Think about the tasks you do every day at your job. How many of them seem tedious and repetitious? Or the tasks that several people do but they all do them differently. Do you have any of those? I bet you do. Those are the tasks that are good candidates for process improvement, or change, or automation, or whatever term you like to use. If you want to know more about how we can help you, then send me an email at mary.ramsey@phocaz.com. I look forward to helping your firm get ahead in the game.